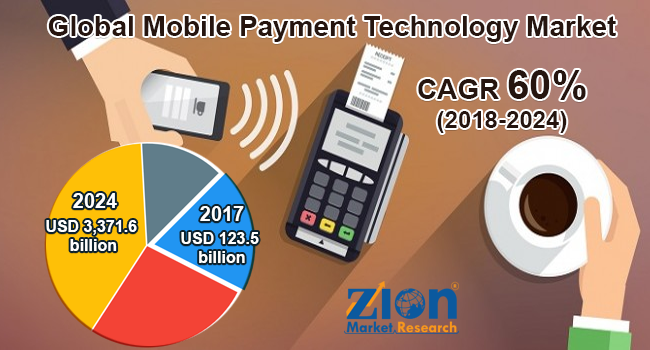 Zion Market Research has published a new report titled “Mobile Payment Technology Market by Payment Mode (Proximity Payment and Remote Payment), by Technology (NFC, QR Code, WAP & Card-Based, Digital Wallet, Banking App-based, SMS-based/DCB, and Others [USSD/STK, MST, etc. ]), and by Application (BFSI, Retail, Healthcare, Entertainment, IT and Telecom, Energy & Utilities, Hospitality & Tourism, and Others [Education, Government]): Global Industry Perspective, Comprehensive Analysis, and Forecast 2017-2024’’. According to the report, the global mobile payment technology market was valued at around USD123.5 billion in 2017 and is expected to reach approximately USD 3,371.6 billion by 2024, at a CAGR of 60% between 2018 and 2024. Payment processed through mobile/ Smartphone for goods, services, or transfer of money is termed as mobile payment, and the technology used to accomplish the task is known as mobile payment technology. This modern method of facilitating payment transactions based on new-age payment channels and technologies is prognosticated to take payment industry to next level. The simplicity and swiftness provided to consumers by means of consistent technological advancement in the mobile payment industry are driving the growth of the global mobile payment technology market. Owing to the humongous rise in the number of mobile users, mobile payments have depicted strong growth in the last couple of years. In 2017, around 50% of the U.S. cell phone users were indulged in some kind of mobile payment activities and the figure is projected to reach 90% by 2020 with the use of various technologies such as Apple Pay and Android Pay. Major factors contributing to the global payment industry growth is high adoption rate of mobile phone users as well as faster internet connectivity, for instance, the increasing penetration of mobile retail transactions and e-commerce activities in the Asian market. In 2016, an m-commerce sector in India accrued revenue of around USD 10.46 billion and is expected to witness a four-fold growth by 2020 to reach USD 40 billion. Also, the increasing penetration rate of contactless POS in shopping malls, restaurants, and small retail shops will drive the mobile payment technology market growth in the coming years. The risks associated in processing mobile payments including financial details of the card owner during the transaction can pose a threat for the market growth. Government initiatives in promoting digital payments are expected to create new opportunities in the mobile payment technology market. Major players operating in the global mobile payment technology market are American Express Co., Fortumo, BhartiAirtel Ltd., MasterCard International Inc., Microsoft Corporation, Boku Inc., PayPal Inc., AT&T Inc., andVisa Inc. The acquisition is the primary strategy adopted by the global players in the mobile payment technology market. In 2015, PayPal, an American multinational company operating in the online payment systems, acquired Xoom, a digital remittance provider.